Piloting, shortly, consists of a set of professional activities on consultancy to Masters of the ships, which is required due to local water peculiarities, aiming to provide safe navigation, from the point of origin, where the Pilot boards, to the ship destination, including docking and undocking, anchoring, and other maneuvers that require specific knowledge. The Pilot is the non-crew member waterway professional whose job is the on board piloting, with continual concentrated attention on the nature, especially on the conditions of navigability within the whole area or extension in which he acts. His entering to this job occurs through national competitive public examination managed and edited by the Maritime Authority, which is represented by the Marinha do Brasil (Brazilian Navy). Our pilots were all approved in these assessments which cover navigation knowledge, legislation, environment, ships stability, naval architecture, shipping-handling, seamanship, nautical signaling, communication, maritime technical English, among other skills needed to perform the service. Finally, the applicants to the function of Pilot must also have college degree, as well as a title issued by the Brazilian Navy in order to prove his nautical knowledge. The Pilot is the first on-land professional to have contact with the ships, and, among other tasks, he has the obligation of informing to public authorities (maritime, ports, customs, medical, Federal Police, etc.) 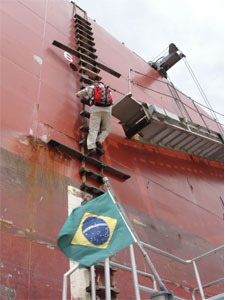 eventual irregularities he may find in ships entering the Brazilian interior waters. The Piloting service requires a sophisticated logistics, with special regard to the Pilot movement concerning to his maritime, terrestrial, and air transportation, planned by his watchtowers (Piloting Stations) and offices located in each and every port cities. 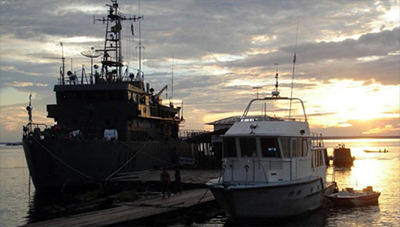 The operation of embarkation and disembarkation of these professionals on the ships are carried out by using Pilots' speedboats – special boats specifically built to this kind of service, and provided with a crew properly trained to this kind of operation – and, it is usually executed with the boats in movement. The Pilot's speedboat is a vessel which must be approved by the Conselho Nacional de Praticagem – CONAPRA (Piloting National Council) to be only and exclusively used for the Pilot's transportation in his embarking and disembarking on the ships. It must have the characteristics concerning the kind of activity it is required to, like robustness and agility, and it must also follow all legal requirements stated on NORMAM-12/DPC-MB, that specifies all basic characteristics need for this kind of vessels. Besides, there is the mandatory approval by the local Maritime Authority, which is only given after verifying compliance on all the legal requirements. The Atalaia (watchtower/Piloting Station) is the operational and administrative structure ratified by CONAPRA, with the capacity of supplying, coordinating, controlling and providing support to the Pilot, as well as perform the communication with the ships and other vessels, within a Zona de Praticagem – ZP (Piloting Area), during the entrance or exit maneuvers in ports and terminals, and ship navigation inside the ZP, allowing this way the continuous availability and the Piloting Service efficient performance, maintaining a constant monitoring of the area towards the preservation of the navigation security and the human life safeguarding. Therefore, this Piloting term covers the set of Pilots, Watchtowers, Piloting Speedboats, and secondary structures, which make ship entrance and exit in ports in a perfect synchronism, with SECURITY, RELIABILITY, and CREDIBILITY, marks of PROA in Western Amazon.